Volkswagen recently set an off road record with the sheer distance the automaker traveled inside of one country. While the Sochi 2014 Winter Olympics have taken over the southwestern corner of Russia, The Volkswagen Amarok have taken over the majority of the rest. These vehicles recently broke a 60 day record in the Russian Outback as these specially modified vehicles drove almost 10,000 miles on a Moscow to Petropavlovsk-Kamchatsky drive. VW did this in partnership with its Winter Olympic promotion, and while the vehicles ended on the large city placed against the Bering Sea, the rather impressive road record featured off road activities that no ordinary vehicle could possibly master. Throughout the drive, the nine man crew did not utilize a single road. For the majority of the drive, the vehicles ran through snow and often times would drive over solid ice waterways in order to reach its designed destination. The multi-team crew did have to help one another on occasion, as the snow became so deep that it would engulf the entire tires, despite having some heavy duty tires and suspension (the exact specifications have not been released on the upgrades made to the vehicles in order to make sure they were able to tear through Russia, from the Western regain all the way down to the Eastern tip near China. 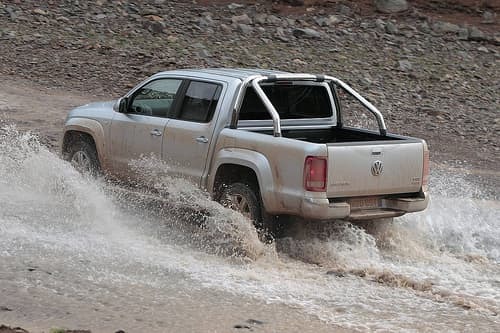 The standard Amarok version of the VW is not currently for sale in the United States at all, although individuals in Europe are able to purchase the standard Amarok truck throughout Europe. This is mostly because of the rather heavy competition for trucks inside of the U.S. and the extremely popular F-150, which currently is the most sold American vehicle inside of the states. This record is the longest any group of vehicles have driven off road in terms of distance in one single country. It is also impressive for where the vehicles performed the task. While individuals have taken off roading vehicles throughout the outback in Australia and other warmer climates, doing so in the dead of winter, across frozen lakes and through snow has significantly improved the overall impression these vehicles have made. The finish of the off road record was set in correspondence with the launch of the Winter Olympics, as VW has provided a large fleet for individuals who are inside of the Sochi Olympics so they can have quality driving options available.